This book review was done for The Englewood Review of Books. Click here to read the review on Englewood’s site. If one of the primary concerns of the missional church is contextual appropriation of the gospel, then both church and academy need Rev. Dr. Edwin David Aponte’s offering, ¡Santo! 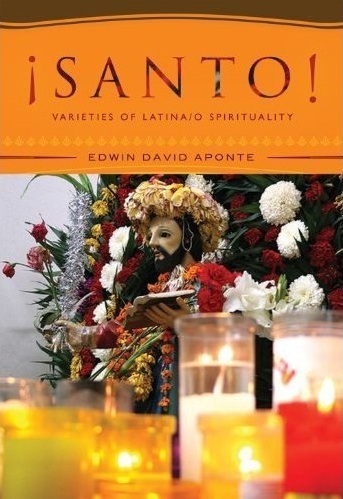 Varieties of Latino/a Spirituality (Maryknoll, NY: Orbis Books, 2012). A book more than twelve years in the making, ¡Santo! speaks to the heart of two of the most sweeping changes in the United States today: a growing Hispanic/Latino(a) population and an increasing search for the sacred and the spiritual. Heretofore the religious and spiritual dimensions of Latinos and Latinas as a group have been under-explored (9). Thus, from the outset Aponte works to dispel presuppositions and open the reader’s mind. What does “Hispanic” mean? Latino and Latina? These terms are not interchangeable. Hispanic refers to a person who descends from a Spanish-speaking nation. Latino/a refers to a person whose ancestry hails from a Latin American country. A Spanish-speaking person may or may not be of Latin heritage; and a Latino/a may or may not speak Spanish. Additionally, Hispanic and Latino/a people’s bloodlines may include native/first nation, African, European, and Arab peoples. Other forms of Hispanic and Latino/a spirituality include Santeria (“the way of the saints”), or Orisha worship, an eclectic African spirit tradition that traveled across the Atlantic with the enslaved Africans (28). Additionally, small percentages of Hispanic and Latino/a people are Mormons and Jehovah’s Witnesses (43-45). With such a variety of religions follows numerous practices. The ways U.S. Hispanic and Latino/a people practice their faith are as multicultural, multilingual, and multicontextual as the people themselves. Rituals surrounding life cycles, such as baptisms or infant dedications, quinceañeras, marriage, and death are most important to Hispanic and Latino/a communities (79-97). In a culture within which la familia es todo (“the family is everything), gathering, celebrating, and mourning together take on deeper significance. Rhetoric and traditions shape lo cotidiano (the regular daily routine, 99-114). Prescribed prayers, private and familial prayers, stories, teachings, sayings, proverbs, greetings, songs, and testimonios echo larger spiritual worlds and deep theological and religious reflections that happen each day (99). A parent blessing a child, “Dios te bendiga” (“God bless you”) as she or he leaves the house for school is far from banal. It “fully expresses the common Lation/a understanding of extended family and community… [and is], along with other dichos (sayings) a part of the very spirituality and religiosity of Hispanics” (108). Sacred space goes beyond cathedral, temple, and mosque (115-132). Many families have altars within their homes in front of which the nuclear and extended family may worship (124-126). Spirit worship and Christianity are innocuously intertwined as people pray to God, deceased loved ones, La Virgen de Guadalupe, and Jesus in one setting. Additionally, “moveable spaces” such as pilgrimages bring together the faithful as they seek blessing from and communion with los santos (the saints). Aponte brings together the variety of Hispanic and Latino/a peoples and spirituality to present the idea of Spanglish. Linguistically, Spanglish is a mixture between Spanish and English. Many second and third generation Hispanic and Latino/a people often speak in both languages in the same conversation. In most instances Spanglish is seen as “vulgar, undignified slang that is to be stamped out at every opportunity” for its lack of purity (136). And yet, following theologian Carmen Nanko-Fernandez, Aponte posits that Spanglish “offers a voice that holds in creative tension the multiple dimensions of hybrid identities” (134). As such, Aponte extends Spanglish metaphorically into culture and spirituality. Essentially, Spanglish spirituality is, like the people its people, a “mishmash” of many cultures, traditions, nations, religions, beliefs, stories, rituals, languages, and lo cotidiano. It has immediate ramifications for ministry, theology, and theological education and offers an avenue for mission and discipleship. The church, contends Aponte, has been missiologically myopic in relation to Hispanic and Latino/a ministry and evangelism. Our first two misguided assumptions are those discussed in depth in the book – we presume Spanish as the primary language (if not only) for our “Hispanic ministries”, as well as a general Christian (most often Catholic) indoctrination. Additionally, we expect our mission field to be filled with recent immigrants. And so, we find a Hispanic/Latin American native who is fluent in Spanish, bring him (usually a man) onto our church staff, and place him in charge of “Hispanic outreach”. Over time we measure success of the “immigrant church” via how closely it resembles the mother congregation (143). This is a dated (not to mention colonial) formula that does not work. The fact is that the vast majority of Hispanics and Latinos/as in the U.S. are second and third generation who are usually bilingual and multicultural. Spanglish spirituality, not the one-size-fits-all Hispanic ministry typical of today’s church, can provide space for a hybrid identity that is informed by the many sources represented in the U.S. Hispanic and Latino/a population (145). If the U.S. church desires to mirror the image of the heavenly worship of the One on the throne depicted in Revelation 7: 9-12, it must make room for cultural and religious blending. Spanglish spirituality not only “expands the understanding of the many forms of Latina and Latino spirituality … [it contributes] to a greater understanding of the nature of human spirituality” (147). ¡Santo! is a meticulously researched book, which is to be expected of academic theology, and it is well organized and written. Aponte’s voice is one of vocational and cultural authority. At times he shares his own narrative to advance arguments. It works well, and does not detract from the scholarly tone. If the purpose of the book is to whet the reader’s appetite for further discussion, then its mission is accomplished. By finding contemporary Hispanic missiology wanting and pressing for Spanglish spirituality in the concluding chapter, Aponte baits and hooks his reader to ask “What next?” I did find myself desiring practical application, however. Perhaps that is the scope of the sequel to ¡Santo! Pray that we will not have to wait another twelve years.